It should be abundantly clear by now that, in general, sports cars and sand do not mix well. 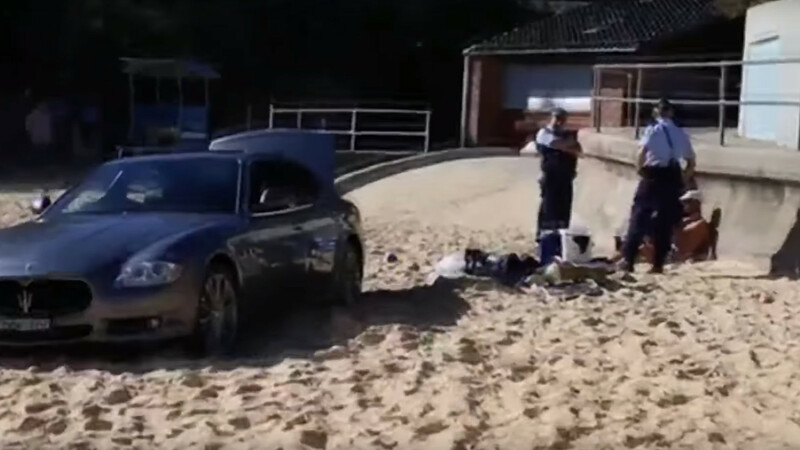 They have literally none of the traits that make a vehicle driveable on the soft stuff—ground clearance, four wheel drive, and soft tires, to name a few—but that didn't stop one man from becoming the latest cautionary tale by beaching his mid-aughts Maserati Quattroporte on the shores of Watsons Bay, Australia on Tuesday. So what does one do after such an embarrassing feat? If you're this guy, hit a few long drives into the ocean to unwind while waiting for help. There's a lot to unpack in this report by The West Australian. Around 10 a.m. local time, beachgoers were shocked to see the Maserati cruise down an access ramp and immediately bury itself up to the axles about 10 feet from the water's edge. After throwing nearly everything out of the car in a failed attempt to lighten the load, he told one witness that he figured if the Maserati can go 200-plus mph (it can't), it would be "fine on the sand" (it won't). Also, he reportedly felt "lucky," having bought the car secondhand at a steep discount. Refusing offers for help, he then began to try and dig it out using only his hands, and when that didn't work, he grabbed his golf clubs and started swinging away. Video from the scene shows some halfway decent form, though he fails to really connect with the ball. Other witnesses say the man was talking "a million miles an hour" about a recent breakup, so it would appear he wasn't in the best state of mind to begin with. Still, one woman who spoke to him during the episode described him as a "nice enough guy" who "just wanted to have a chat." After a few awkward minutes, the police finally showed up and took him away in an ambulance for an evaluation, while the Maserati and his golf clubs were impounded. It remains to be seen if he'll be charged with anything, but it's safe to say his beach driving days are over. No, that's not a metaphor. But it is plenty dirty. These hooligans are making the most out of flooding in Queensland, Australia.